Oh Jones...: WE HAVE THE SAME LAST NAME! I feel real feelings for television characters. I robot in and out of situations if I don't know how to act. It's pretty amusing for my friends...pretty mortifying for me. However, it has become my trademark so I go with it. I'm a grad student (gross right?) and I have an assistantship as a hall director for a first year residence hall. Because of my job I get to call campus police from time to time. Usually the cops they send over are guys that are older and have some sort of mustache or male pattern baldness. I joke with them, we get along. Ok that's a lie but I think they should carry some in their cars. Sometimes I get low blood sugar.....or hungry. All I'm saying is that it'd be convenient. "Hey that's my last name too! Now get this hoodlum resident up out of here." Again that's a lie my residents aren't hoodlums. The cops usually come for fire drills. I just like to sound tough. Instead they send the most attractive man I've seen in awhile. 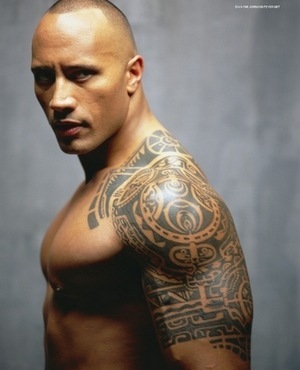 He's like a skinnier version of the Rock. "HEY UM...HEY I'M ASHLEY JONES. WE HAVE UM THE LIKE SAME LAST NAME AND UM. I'M EMBARRASSED...I DIDN'T KNOW THEY WERE SENDING YOU OVER.. BUT UM HA LIKE I UM. YEAH SO...SAME LAST NAME THAT'S CRAZY RIGHT? WHAT ARE THE ODDS? OH BOY. WHY ARE YOU HERE AGAIN? AM I STILL TALKING? DID I BLACK OUT? " If you've ever been around me when an attractive male is around my voice gets really high. Like decibels only dogs can hear. I get so incredibly nervous around good looking people that I literally melt down. I immediately hate my outfit and convince myself boogers are hanging out of my nose because that's the kind of luck I have. After I came back to reality I realized that not only was it inappropriate for me to throw my underwear and bra at him like I did at the last *NSYNC concert, but should probably take care of the incident at hand. Luckily he didn't seem to freaked out but he's a cop he can't show fear. I thought that would be last time I would see him. Fast forward to 5 days later. Long story short a couple of my friends and I got locked out of a building and needed a campus cadet to come help us out. I was all business on the phone. After 25 minutes of waiting in the cold I flagged down a passing police car. Who got out of the car? Whatever professional courtesy I had with the dispatcher on the phone was long gone. "OFFICER JONES! HEY IT'S ME ASHLEY JONES THE HALL DIRECTOR! UM HA FUNNY THING SEEING YOU HERE! NO I KNOW I FLAGGED YOU DOWN...UM SO...WOULD YOU BE ABLE TO UNLOCK THE BUILDING? MAYBE INFORM ME OF WHAT YOUR RELATIONSHIP STATUS WOULD BE SHOULD YOU PUT IT ON FACEBOOK? DID I MENTION MY LAST NAME WAS JONES? IMAGINE ALL THE PAPER WORK I WOULDN'T HAVE TO FILL OUT SHOULD WE EVER DECIDE TO GET MARRIED!" That last part may have not been said aloud but it was most certainly thought. I don't know what is happening but I'm raging out of control. The older I get the less acceptable it is for me to be out in public. This man is an officer of the law. I need to show him respect. Understand that he has a job to serve and protect our students. I do imagine him interrogating individuals (perps if you will) and giving them the "eye brow." Or like jumping off the top of buildings onto escaping students...who, I don't know, knocked over the on campus Quiznos. All I'm saying is that if any of you get a phone call from a restricted number, answer it as it might be me asking for you to come get me from Campus Jail. Campus Jail is also known as County Jail. I am a single monster. aahaha. trust me, I've totally done that. Ashley- I have seen Officer Jones and I think your reaction is acceptable. He is so attractive!